The Sun Odyssey 43 is the perfect boat for comfortable cruising. The main salon, with its raised coach roof and large windows, provides an abundance of ventilation and sunlight making this boat bright, airy and comfortable at all times. 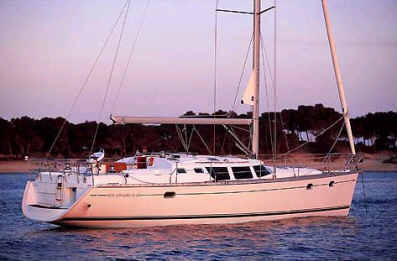 The Jeanneau 43 has three double cabins and one single. The spacious main suite with centerline queen size bed has a private head and shower. The second and third cabins are located aft with an additional head and shower. The Jeanneau 43 has classic slab and roller reefing, one wheel steering and a electric anchor winch. There is a bimini and dodger, an ondeck shower and BBQ,AM/FM radio & CD player, fully equipped galley with LPG stove & oven, fridge/freezer, pre-charter cruising guides, full boat and chart briefing. Optional extras include an outboard engine for the tender, sea kayaks, a skipper and a provisioning service.